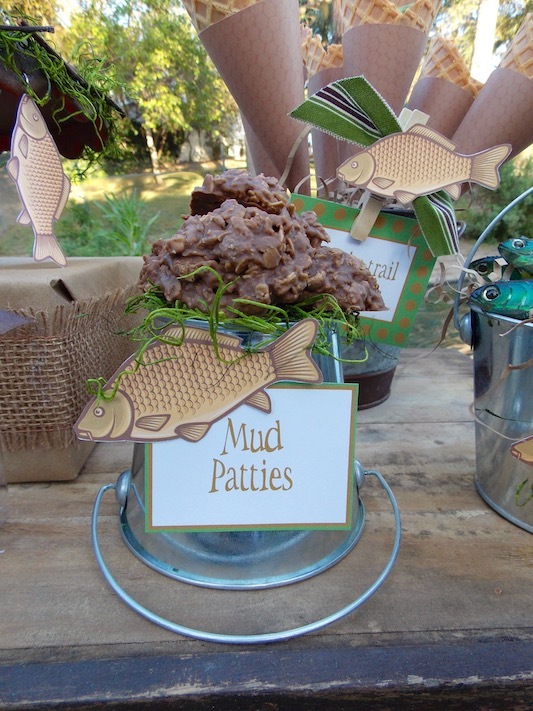 I recently stumbled upon this fun fishing party that I put together for my little guy, Jordan. During this time, he was only 2 years old! (he'll be 7, later this year!) 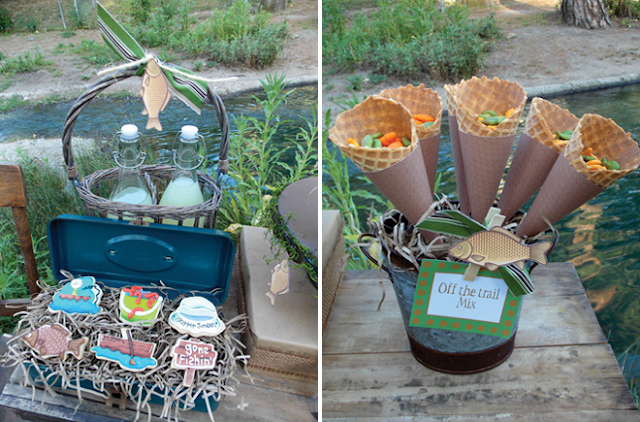 I had so much fun prepping for his little party, and my little guy had so much fun splashing his fishing pole in the water! 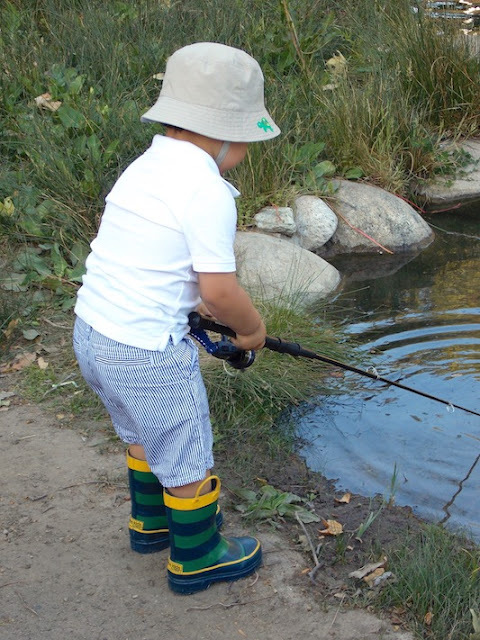 He loved walking around in his boots, and his new fishing hat! 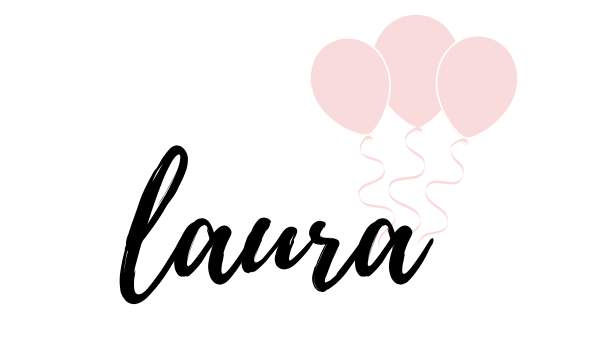 I did a lot of projects on my own, and even re-purposed a few pieces that I'll share! 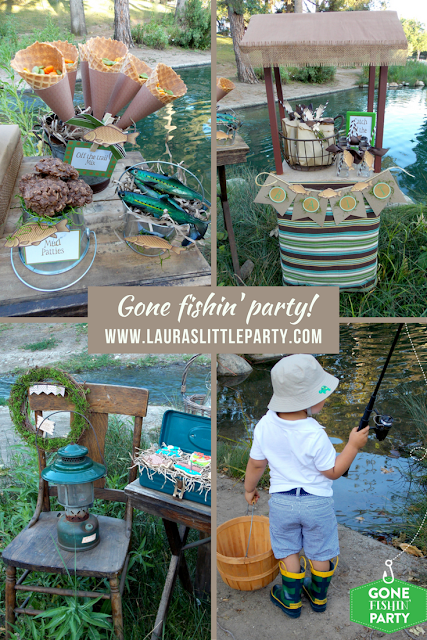 I hope you love my fishing party as much as I loved putting it together! 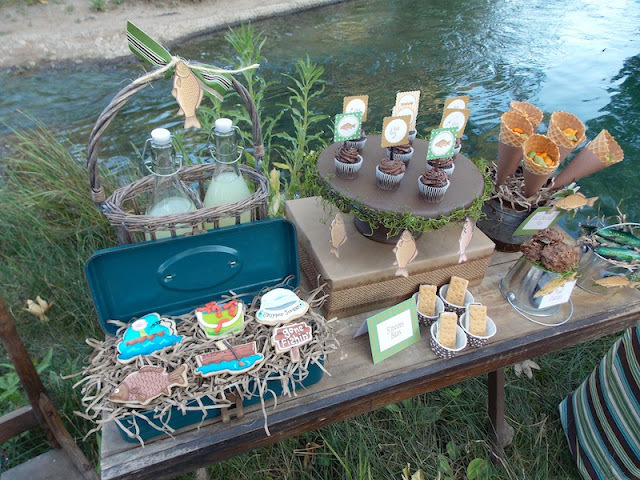 It's fun looking back at old parties that I created. We still love to visit this lake, and have had a few parties here. 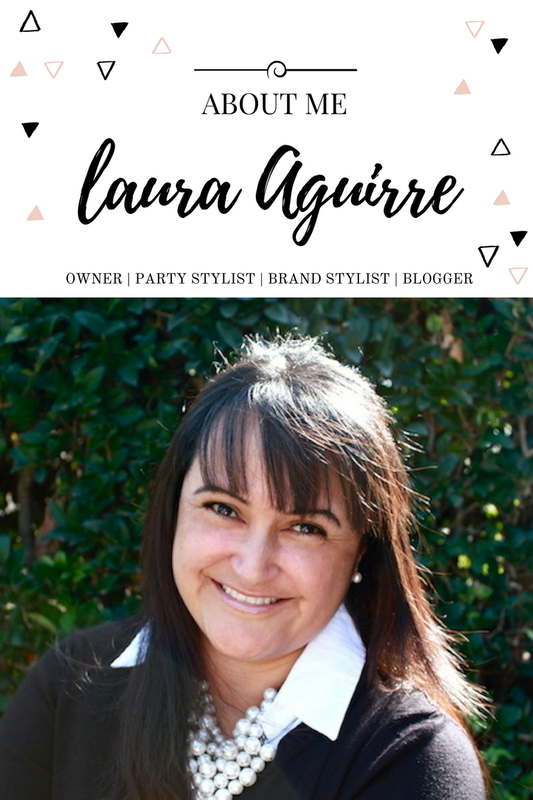 Scroll through my pictures, and be sure to check out the DIY projects I've posted. 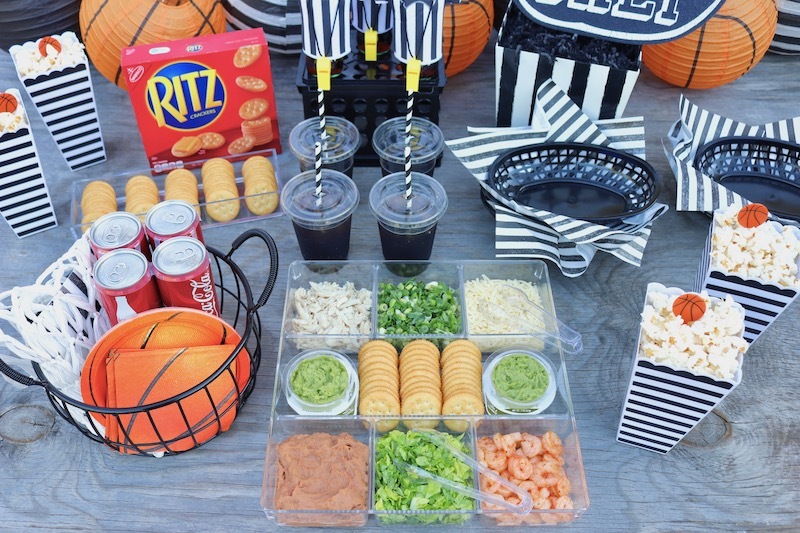 I love putting parties together that are budget-friendly. 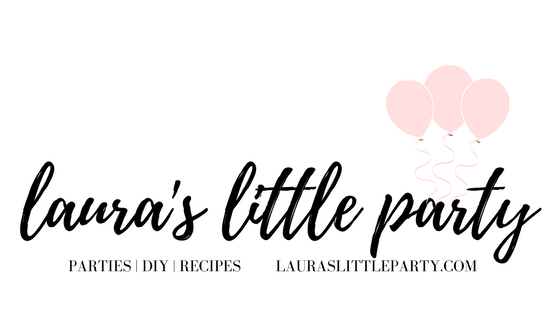 With as many parties as I throw during the year, it's necessary to do so! 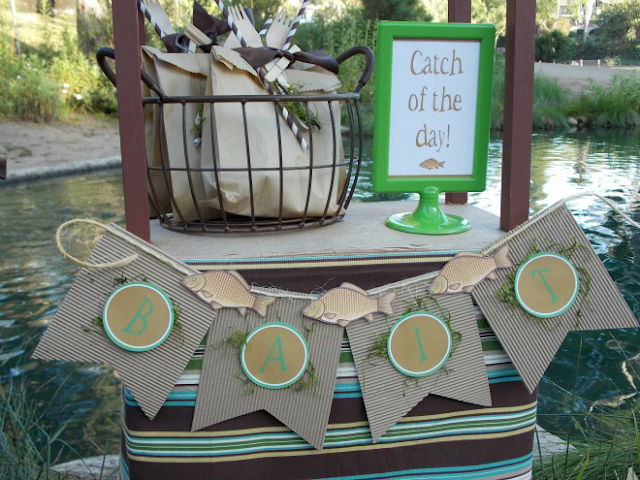 I created the fishing printables for the mini cupcakes, and made the "bait" banner for our "catch of the day"/bait stand. 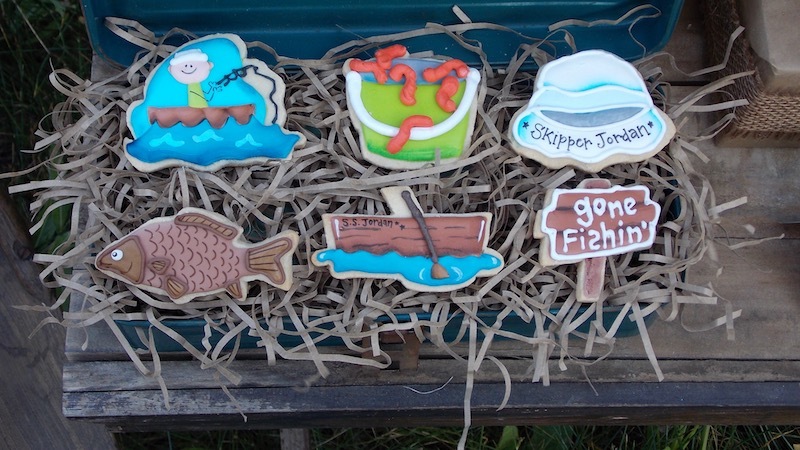 I especially loved these cookies from She Wears The Crown! I set them inside of an old fishing tackle box. Aren't they adorable?! I put together this simple wreath to hang on a chair, after I purchased a grapevine wreath that I found on clearance. I took a bag of moss that I found from Walmart, and hot glued pieces onto the wreath. Don't you just love this moss riddled cake stand? 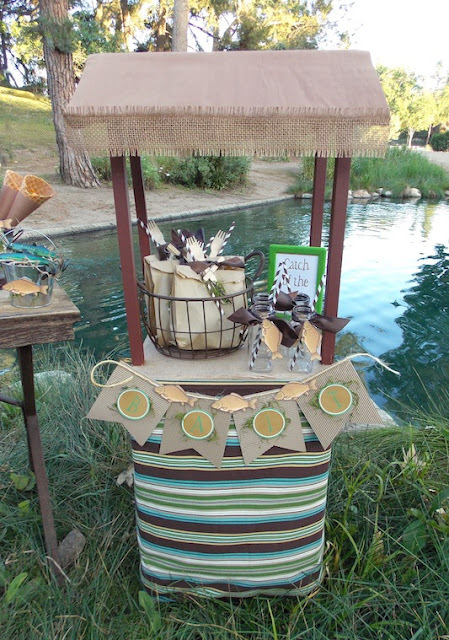 This was also a fun project I created especially for this party. I found this red, Christmas themed cake plate at my local goodwill, for $4.99 I originally had a different purpose for this, but I found it to be perfect for my fishing party! I removed the wired candies that were dangling around the sides, and found some brown, textured spray paint left over in my garage, from a previous project. I sprayed the plate, and instantly fell in love with the color, and the direction it was taking me! I added some moss from my wreath project, hot glued real twigs around the sides, and then printed some fish graphics, and "hooked" them on paper clips. I still can't believe the huge transformation! This is still one of my favorite parties to date! I hope I've inspired some easy DIY projects, or even your own take on a fishing party. 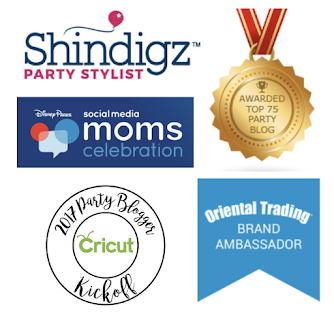 Here's a pin for your inspiration boards. Happy Fishing! That cake stand is AMAZING! I love how the fish look like they are on hooks.